Do you ever think that you’d be better off as a man? As readers of a feminist magazine like Lip, you’ve probably given some thought to the notion that inequality exists, that it occurs daily in a variety of different situations, that it rears its ugly head in a hundred different ways, and that career-wise you’d probably get better treatment and more advancement opportunities if you had a P instead of a V. But have you ever thought about changing – or disguising – your gender in order to secure that opportunity? This is the central premise of The Blazing World, a new novel from American author Siri Hustvedt, her first since 2011’s The Summer Without Men. The enigmatic, possibly-mad artist Harriet Burden – Harry to her friends – withdraws from the New York art scene after failing to gain much-desired critical recognition, citing the scene’s ‘antifemale bias’ as the cause of her failure. Or, at least, she appears to withdraw. Instead, Burden has her work shown by three different male artists – a wunderkind, an outsider artist, and an established art-world celebrity – all pretending her work is their own, in order to create a larger artwork entitled Maskings, a written documentation of the critical acclaim her pieces receive when presented as man-made, and the subsequent backlash she experiences when her role in the works’ creation is revealed. The reader explores the consequences of Burden’s sociological-artistic investigation through fragments of her notebooks, interviews with her family and friends, and interviews with art critics and other art world figures; all compiled by the ‘editor’ of The Blazing World: the book-within-the-book, an academic excavation of the artist’s life and work and – perhaps? – the very book the reader holds in their hands. Burden’s concept of the self that contains multiple selves manifests as Maskings; it is her ambitious, personal project to reinvent herself through her male avatars, her attempt to grasp some of what her unavoidably female body has always prevented her from getting a firm hold on: success, independence, and a realisation of her identity as she sees it. Hustvedt has written about the art scene before, with characters from within her 2003 novel What I Loved creating artworks similar to the ones described as Burden’s: miniaturised domestic scenes, figures interacting with written symbols and fragments of text, figures that stand in for lost loved ones. For despite Burden’s preoccupation with the limitations of gender, The Blazing World worries most about the ways in which outside-perception warps inner-identity. She is perceived by the art world as creating art that is silly, frivolous, the craft-work of a bored mother and housewife; her perception of her husband, Felix, is altered by her intense feelings of grief and loneliness after his sudden death – her attempts to express her grief through art is the trigger for her creation of Maskings. Hustvedt convincingly emulates a range of characters, alternating between perspectives and never failing to create distinct voices for all of them. 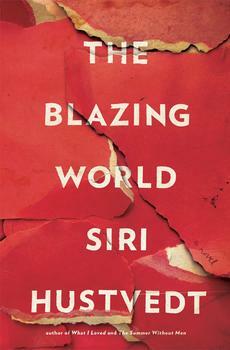 This alone would make The Blazing World a powerful novel, but it is the seemingly authentic academic structure that makes the novel’s arguments persuasive. The story is so well written, so carefully structured; with rich supporting detail and historical research woven into it. It is Hustvedt’s ability to convince you that what you are reading is a piece of non-fiction that makes it her best work to date. By the end, the reader is left with two contradictory pieces of knowledge. You have just read a novel. Everything you have just read is real. That is the strength of The Blazing World: Burden was not real, but she so easily could be. Hustvedt has not written a piece of speculative fiction, a what-if scenario; she has written a novel exploring real issues, facing real women, not just in the arts sector but in all spheres of their lives, both professional and personal. Pick up a copy of The Blazing World here! This entry was posted in Arts, Books and tagged art, book reviews, books. Bookmark the permalink.